I bought these over-sized pine cones from Hobby Lobby, but you can use freebies collected from your yard or an obliging neighbor. Insert a small screw eye into the woody end of the pine cone. I just twisted it in with my fingers, but you can use a drill or a small nail to create a pilot hole, if necessary. For some crazy reason, I thought, “This must be what it’s like to paint a Moose’s toe nail.” Weird. And yes, I’m aware Moose have hooves. I applied the glue heavier on top, so when sprinkled with glitter it references a snow-dusted pine cone. I poured my glitter into a baking dish, so I could sprinkle the pine cone with glitter and catch all of the excess. 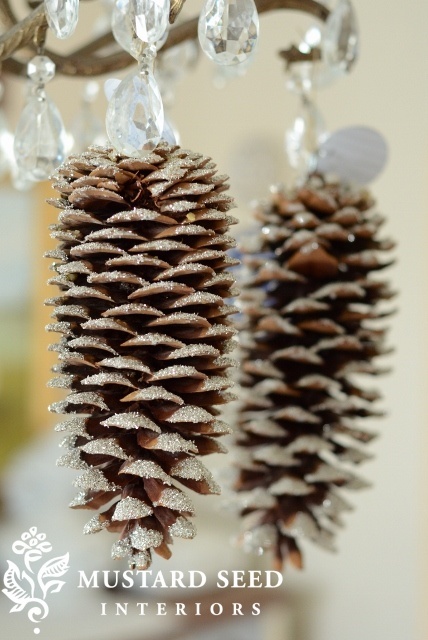 Once the glued areas were coated, I turned the pine cone to shake out all of the loose glitter. One of the nice things about glass glitter is that it doesn’t cling and stick to everything like foil glitter does. You can still end up with a sparkly house, but it vacuums up easily and you don’t end up with a piece of glitter embedded in your forehead that people are trying to scratch off two days later.